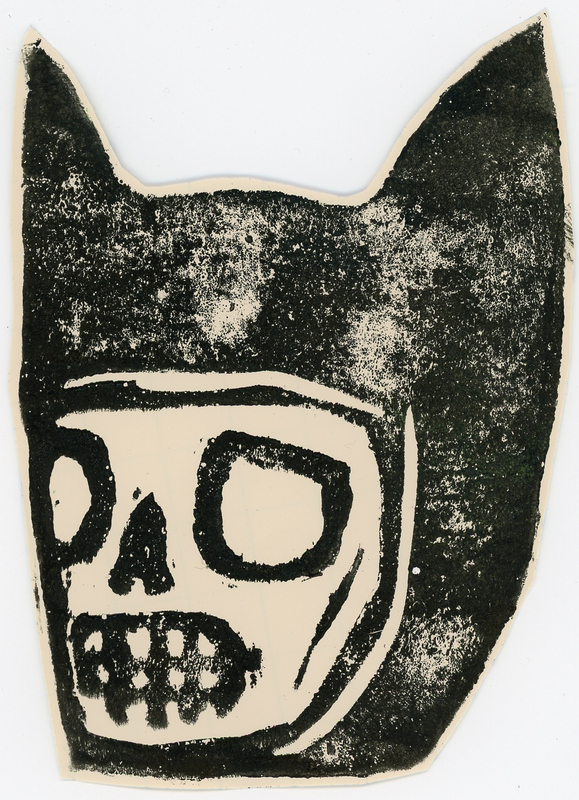 This vinyl sticker by artist Starheadboy features a skull with cat ears. When asked about this sticker in particular, the artist said, “Some of the characters in the form of stickers that go out on the streets have backstories, the cat eared skull character is the one that's named Starheadboy. That one came from a series of autobiographical comics that I did around ten years ago… The materials that I like the most for stickers is oil based ink on vinyl, they hold up great in the northwest climate (the two examples that you have are both oil based ink on vinyl) I make a stamp out of carving a piece of linoleum to make those. I also make hand drawn stickers.” The materials that I like the most for stickers is oil based ink on vinyl, they hold up great in the northwest climate (the two examples that you have are both oil based ink on vinyl) I make a stamp out of carving a piece of linoleum to make those. I also make hand drawn stickers.